No army is ever complete. So why rush forward to complete a project only to be faced with the prospect of starting another one and slogging through it at point zero? Work on multiple projects consistently, a squad or character at a time, and there will come a point, a year or so down the line, where you will see your work bear fruit. *You're trying to gear up for a particular event. *You really need (i.e. want) to play with a particular army. This is a typical collection of "batches" for me. Note, I will not work on all of these simultaneously, but I rotated two or three projects from this batch (and others). As I worked on these models, I'd be adding to my armies of High Elves, Wood Elves, Legion of Everblight, Khador, Cygnar, and Skorne. And this is just the primer batch. As you can see, there are models in half finished states that can also be included as batches in the rotation. 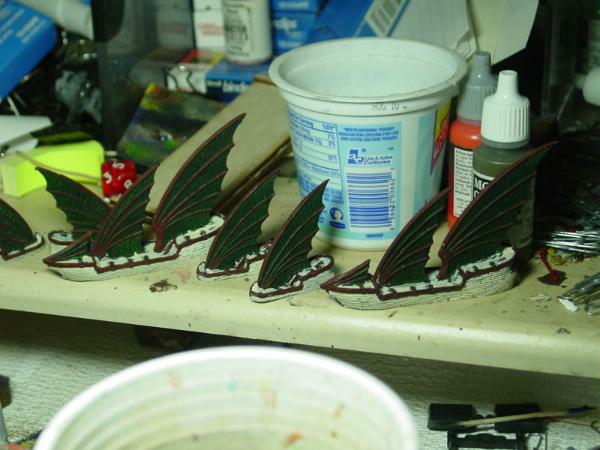 First I decided to finish some unfinished projects before I hit the newly primered models. My first two batches were two unfinished squads for Warhammer 40,000. *Alternate between your batches however you may see fit until you've finished one of the batches. It isn't necessary to finish the batches at the same time. You might want to spend more time on a batch of elites while your work on "Filler" troops finishes much faster. *Rotate in a new batch of models to replace the completed one. Remember to choose based on what's already on your painting table. I replaced the orks with the Uncharted Seas boxed set, which was annoying for me to paint. In order to balance out the annoying models to paint, I had to pair them with something easier to paint, something familiar. This was a batch of ONE Skorne model. It eased my mind off the annoying Uncharted Seas fleet as I was used to painting gold, but it was only because it's a character and, as you can see, there are tons of gold detail to paint onto it. 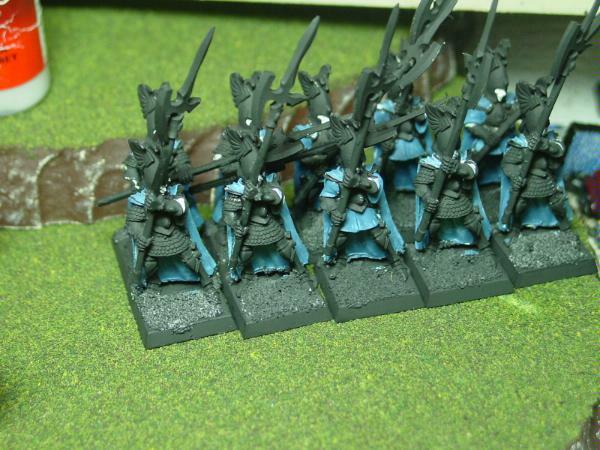 I already have a process down for painting Wood Elves, so it made sense for me to finish some models for that army. The Eternal Guard are actually a "filler" batch for some ungodly Death Star unit I'm planning in the far future, and the two Glade Riders fill out my existing painted collection of 8 Glade Rider models so that I'll be able to field two of the Fast Cavalry units. As soon as I finished those batches, I swapped in some Cygnar and Protectorate of Menoth batches. 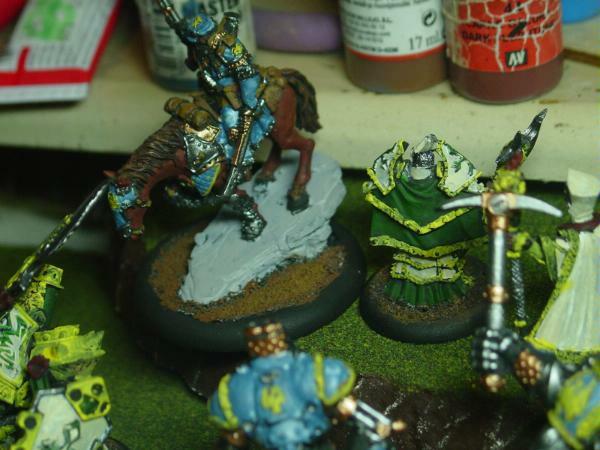 Warcasters and warlocks for Warmachine are good choices as a batch unto themselves as they change the way your army plays. In this case, the Cygnar batch includes Jeremiah Kraye, two light warjacks and the officers for the trenchers, as the addition of them alone changes my Cygnar force considerably. 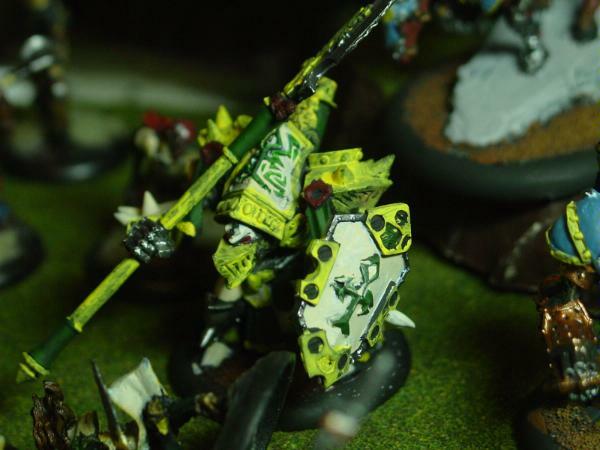 The Protectorate of Menoth batch includes models that were released for [[Warmachine:Legends]]. This army is my go-to army, and so I'm generally not playing catch up when I paint for them. Mostly I'm painting filler. In this case it's the Blessing of Vengeance warjack, Allegiant Solos, Visgoth Rhoven and the Hierophant. All of these models changed my gameplay with the Protectorate dramatically. 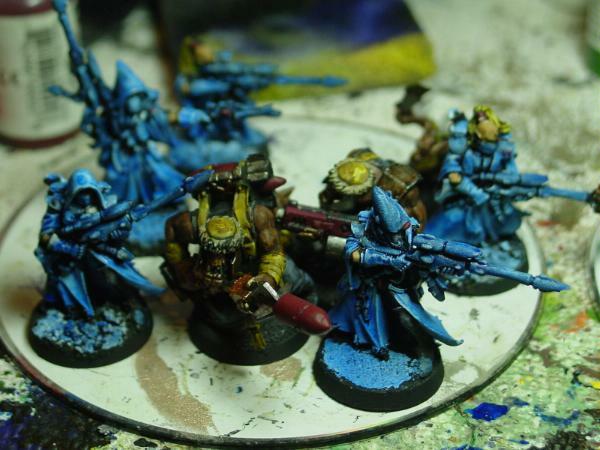 Man O War Shocktroopers are five models, medium based for Khador. They helped fill out my Khador force with epic Butcher. The Shocktroopers were different from painting 10 Phoenix Guard. 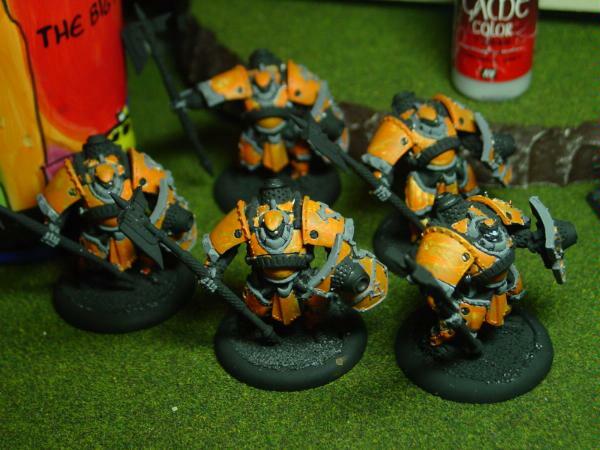 I got to play with metals and yellow trim with Elves, vs. the orange and gray theme I had with the Khador. It never really felt like a chore. In the end, it's about receiving constant feedback about your progression with your armies. The worst thing for me is to try to paint squad after squad. Even if they're all for the same force, it feels like a treadmill that never gets you anywhere. While painting for multiple armies I'm always pleased to add 100-200 points to an existing force, and it's always nice to look up and say, "Oh wait, I have an army now!" Part of this was also to stem my purchasing of models that ended up sitting on the shelf, unpainted. I disallowed myself from buying anything new utnil I had painted up a batch of models for that force. I think that rotating through my armies lead to me to paint faster, as every batch felt fresh and new. However, painting faster strained the budget as I was constantly refreshing my supply of soldiers for different armies and different factions. I think I have that under control now, but at least I know I can handle larger paint jobs if I have to. *It's good to have a playable force on hand when doing this, as playing games will grow your itch to spend time painting and vice versa. *When this process is followed, you'll find yourself looking for models to paint. This is why your friend who likes to paint will paint models for you. *This is definitely not a method for everyone. Another tip is to keep the batches you're not working on out of sight (and out of mind). Surprise yourself when it's time to rotate. "Oh, I haven't thought of my Dwarves in ages!" So it's more of a time management system than a real skill based tutorial. Sorry! Still a good idea! Good write-up, malfred. I have similar problems, but I only have two 40k related armies to worry about. Anyway, if anyone has done something similar, I'd like to hear about it. Im with you malfred - although I attributed it to a form of ADD :p. Ive got a CSM army thats being slowly re-painted (after I got better at painting, Im now going over the old stuff), a Daemon Prince conversion, a city of death to paint (basecoated and washed with ink so far) and i just started converting catachans (playing with creating chainmail in greenstuff). Basically, any time spent progressing one or more of these keeps your interest going, maintains the fun, and means you are never ever finished anything! 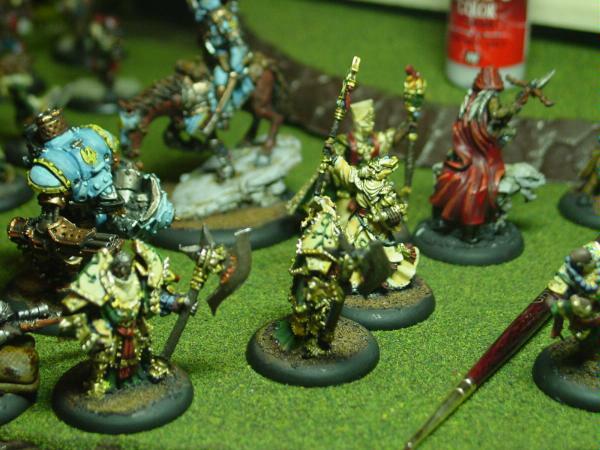 Painting Blog - http://www.dakkadakka.com/dakkaforum/posts/list/244402.page - leave a comment! So I am not crazy, nor am I alone in my insanity. Daunting indeed - unless you look at each model as its own project - then you get lots of little wins! Oh yeah, I forgot my Orlocks gang too (for when i want to mix things up!). I read the title and though, isnt that what we all do; procrastinate, jump from project to project, never finish any of it, and wind up with a pile of half converted half painted armies, with a few standout finished models? Then I read the article, and said, maybe this is a system that would prevent me from doing the aforementioned, but quickly realized I am me, and dont know how not to be. Seriously though, it is a good article on how not to lose your mind when you have 6 projects to do and dont want to hyper-focus on one till it's done. It outlines an excellent management plan that prevents people from buying armies that will sit around for months before they get worked on. Only YOU could've made this Tutorial Malf! I like the rotating batches idea, I need to try that out. 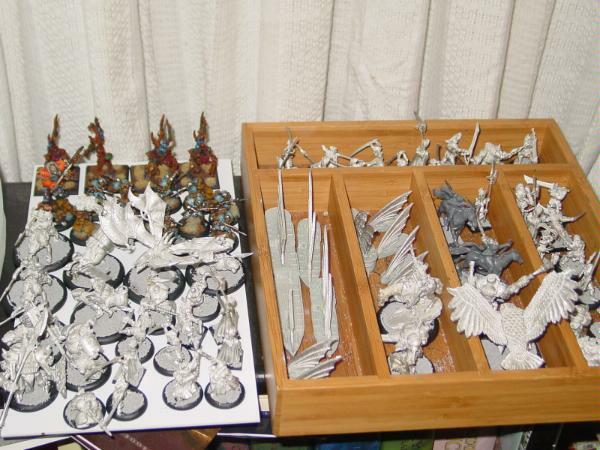 I've got Dwarves/Skaven/Lizardmen for Fantasy to work on as well as Imperial/Space Marines/Orks for 40K. I can use all the help I can get to finish as many models as possible. P4NC4K3 wrote: Only YOU could've made this Tutorial Malf! Not sure how to take that.